The most dangerous snakes in the world. Or not? Maybe Australians like the idea that Australian venomous snakes are the deadliest in the world. Maybe it makes us look brave and tough in the eyes of the rest of the world. Supposedly the most dangerous Australian snake: the Inland Taipan or Fierce Snake. The deadliest of all Australian Animals, responsible for an average of 10 deaths per year, is the European Honey Bee. But even people allergic to bee stings are nowhere near as scared of bees as most people are of Australian snakes. They also don't scream and jump up and down or try to kill any bee that ventures near them. They stay calm and act sensibly to avoid getting stung. 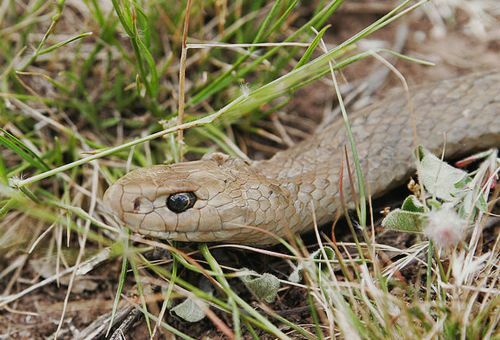 The second most venomous Australian snake: the Eastern Brown Snake. I personally know of two people in my town who got bitten trying to kill one. Evidence indicates that a lot of our fear of snakes is instinctive. On other continents, where venomous snakes evolved together with humans, this might make sense. Snakes there have developed means to defend themselves against human predation, for example spitting venom like the Cobra does. Like all other Australian animals our poisonous snakes haven't had to deal with humans until more recently. As a result they are very inoffensive and shy. Snake bites are not a common occurrence in Australia at all! Many bites happen when people handle or try to kill venomous snakes. Alcohol is involved in a significant number of snake bites. Largely due to their behaviour, Australia's poisonous snakes are actually some of the least dangerous in the world. Let's look at a different aspect. How Venomous Are Australian Snakes Really? Australian snakes are the most venomous in the world. 7 of the worlds 10 most poisonous snakes live in Australia. The first five snakes and most of the snakes on a list of the worlds most venomous snakes are Australian. And sometimes such a list is called a list of the most dangerous snakes. Which is utter nonsense. For starters one important little note is missing. It should always (and sometimes does) read: "These are the most venomous snakes if you are a mouse." The toxicity of snake venom is tested in mice. Mice aren't people. The above mentioned lists have limited relevance for humans. Mind you, all Australian venomous snakes have the potential to be dangerous, as venom sensitivity in individual people varies enormously. And it certainly varies between people and mice! Many snakes that cause thousands of deaths a year never made the list. Maybe their venom isn't all that toxic to mice? And ponder this. Mouse tissue is 50 times less responsive to Sydney Funnel-web Spider venom than human tissue. In one study adult mice were unaffected by the spider venom. You could mistakenly think this spider is harmless when examining the toxicity of its venom on mice. In short, the above list is meaningless if you want to judge how dangerous a snake is for you. Even if the venom toxicity was the same in mice and people, a list like that is still meaningless, unless you take snake behaviour and distribution into account. The number of people who have seen an Inland Taipan in the wild can be counted using your fingers. 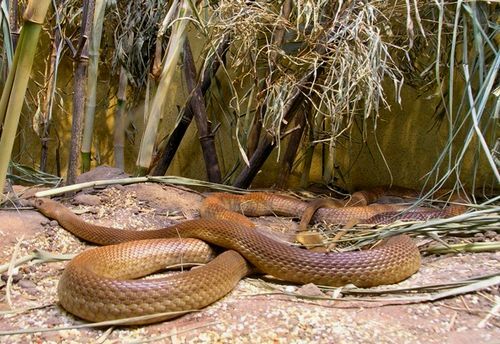 The Inland Taipan is extremely shy and reclusive! Interesting: on September 27, 2012 a 17 year old boy got himself bitten by an Inland Taipan. The accident happened far away from the snake's natural habitat. Apparently the boy was bitten while trying to force feed the snake, who obviously wasn't hungry. The most likely explanation is that the snake was an illegal pet. Which just once more confirms what I keep saying: to get yourself bitten by an Australian snake you have to ask for it. Oh yeah, and the boy survived. Also, most Australian snakes have tiny teeth. The fangs are a joke if you compare them to those of a viper for example. Australian snakes are very ineffective at delivering their venom. Add up all of the above and it becomes easy to see why despite their very potent venom Australian snakes belong to the least dangerous poisonous snakes in the world. Don't get me wrong. 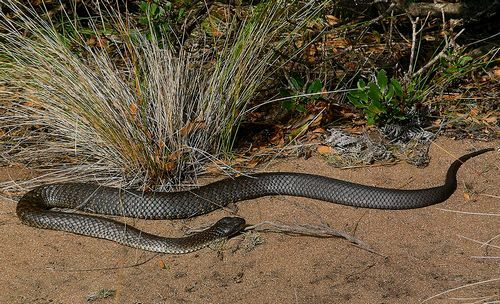 If you get yourself bitten by an Eastern Brown Snake, and if the snake does in fact inject venom into you (they rarely do, a bite is often just a warning), and if you don't treat the bite quickly and correctly, there is a good chance that you will die. The same is true for the venom of Tiger Snakes, Taipans etc. It can kill. But to get bitten in the first place you have to ask for it. Their venom may be potent, but the hype that Australian snakes are the most dangerous in the world is nonsense. Don't worry about poisonous Australian snakes. Just stick to the guidelines I spell out on this page. Australian snakes are beautiful and fascinating animals and play an important role in our environment. Let them enjoy their day as you enjoy yours! The Outback > Animals > Snakes > How Dangerous Are Poisonous Australian Snakes?